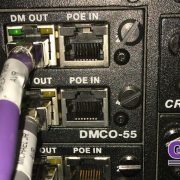 We recently highlighted how we use our expertise and experience to effectively take over problematic Crestron systems. Today we will take a closer look at a financial firm in New Jersey and how we solved the ongoing issues with their automated video conferencing and audio system. Some background on this project, a few years ago we were bidding on a project to design and build an automated video conferencing system for a financial firm near our location in Short Hills, New Jersey. After going through the bid process, we lost the job to a company who was charging significantly less for the work. While we never like to lose a job, we did not judge the client for their decision and moved on to the other jobs in our queue. 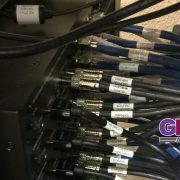 Fast forward to now, we received a call from the same company, asking us to come diagnose some issues they were having with their Crestron system that the installing company could not figure out. Our first step, of course, was to find out from the client how they are being affected by the problem. They were not able to use their ClearOne video conferencing system without a constant popping or hissing sound out of the integrated audio, they also could not tell when an individual microphone was muted or not, causing confusion during calls. Basically, the system wasn’t doing the job effectively despite having the potential to do what it needed to do. To solve the problem we started at the beginning, which for us is to examine the existing system and learn how it was put together, followed by an overhaul of the system’s wiring to ensure that all wiring is run cleanly, correctly and with proper terminations. One of the biggest points of failure in this system was the use of low-quality wire in between the components, we replaced this with a higher quality of cleanly installed XLR wiring to increase the audio quality during the conference calls, where everyone needs to be clearly understood as well as clearly understand what is being said. To solve the microphone issue we engineered a hardware solution for the tabletop microphones. This was simply installing a small LED light box on each microphone with a red and green light toggle to indicate when the microphones were muted or when they were not. Once all of these steps were completed, we fully balanced the audio to work with the acoustics of the existing room, leaving a fully functional system that exceeded our client’s expectations. 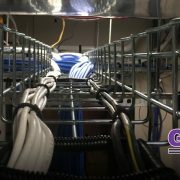 The most important part of this story is that we were able to solve the customer’s issues without installing and new hardware, using entirely pre-existing ClearOne and Crestron components. We were able to do this by leveraging our relationship with ClearOne, who helped us do significant coding and firmware updates for the video conferencing system. 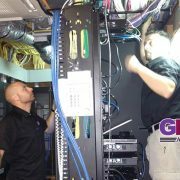 Unlike GMI, some integrators do not use the support that they have to provide the best service in the quickest amount of time with the least amount of resistance. In any industry, it is important to be cost effective in what you do. Though the fact remains, if you don’t understand the proper amount of labor and time required to make sure a project is completed the right way and not the easy way, you will fail. When you try to cut corners to meet a deadline, you shoot yourself in the foot and by the time you get to the end of the project it’s too late. There are so many points and little parts of a system that can go wrong that need to be done correctly the first time and taking shortcuts when expectations are this high is only going to cause trouble for you and your clients. It just goes to show, that in the world of high-end automation, you get what you pay for. 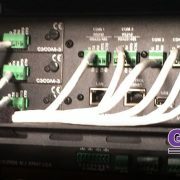 Having trouble with your existing Crestron system and don’t know where to turn? Contact us today for a free consultation.